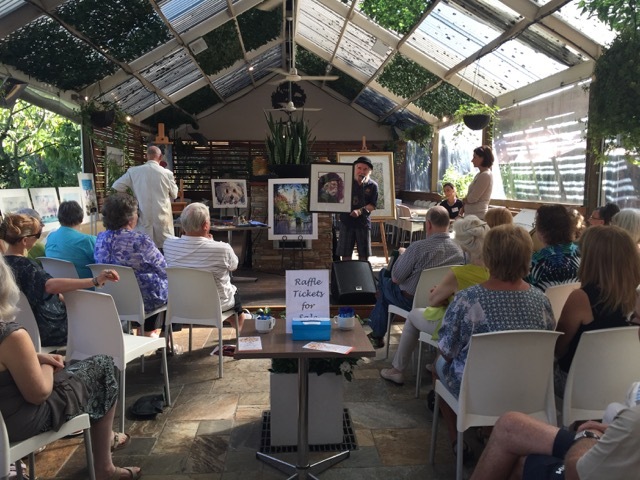 An artistic morning tea was held with art talks and a painting demonstration enjoyed by artists, art lovers and friends of Warranwood Art Show on 2 March 2016 as part of its Seasonal Events series. Held at WarranGlen Garden Centre & Café in Warrandyte, guests enjoyed a superb morning tea with guest artists Malcolm Beattie, Walter Magilton and Agnes Parcesepe. Walter Magilton delighted the audience speaking about his art and life of 70 years of painting, showing a host of artworks and with much humour and inspiration. 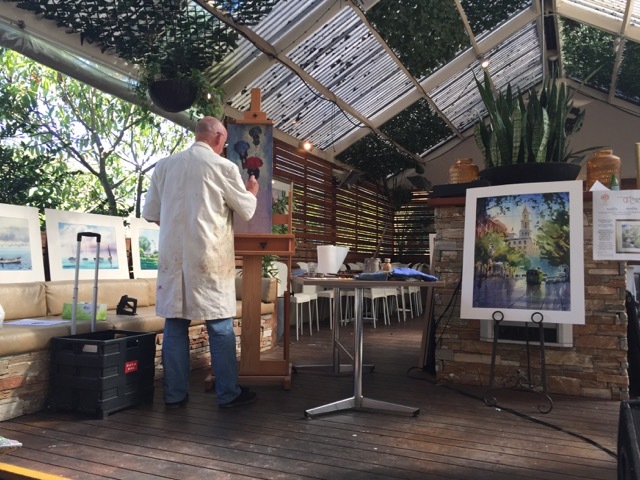 A professional painter, Walter also writes, was a one time sculptor and now teaches from his Stony Creek Studio in Warrandyte. Winning over 500 awards, countless exhibitions in Australia and England, he is a man of legend with an incredible drive and passion for life. Malcolm Beattie demonstrated oil painting and then spoke of his life of art drawing as a child on walls and in the margins of paper at every single opportunity. Later art droughts brought dismay and a standstill but an astounding sudden revelation brought renewed passion and fervor for his art. He began to draw and paint again which led to his first painting exhibition and gallery representation, then resigning his cartography (day) job much to the delight of his family. Malcolm continues to paint, teach, demonstrate, tour and enjoy his art at every opportunity. He now describes his current job as ‘a small business person in fine art’. Agnes Parcesepe wasn’t able to pursue her art for 32 years, then she ran away to realise her artistic passion. Very glad she stuck with her art, her advice was to ‘never give up what’s in your heart, and express what you feel’. Her first artshow was at Ivanhoe where everything sold. Today, Agnes is invited to exhibit the world over from Los Angeles, Boston and New York to winning awards in Rome. Agnes is soon to be applauded once again, this time whilst boating the canals of Venice. Warranwood Art Show thanks Agnes for her beautiful watercolour painting, ‘House at Montsalvat’ generously gifted for raffle by the Warranwood Art Show's April 2016 exhibition. Warranwood Art Show’s Seasonal Events form part of its Vision to bring events to the local, arts and greater communities, that inform and demonstrate to fulfil its goal towards ‘supporting the artistic community’.